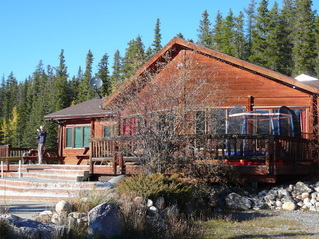 Join the Edmonton Recorder Society for our Annual Retreat at the Centre for Outdoor Education (COE) in the spectacular Alberta Rocky Mountain foothills. This is a time to have fun, meet great people, renew acquaintances, expand your recorder horizons, and make beautiful music. Players at all levels are welcome. Complete the registration form here. Payment can be by mail or e-transfer. Please register early. Space is limited. Non-players are welcome, but in case of over-subscription, priority will be given to recorder players in the order in which they register. Room and session assignments will be posted in the COE when you arrive. Scroll to the end to read about changes - instigated in 2017 - in our small group sessions - based on extensive interviews with retreat participants. This is a time to make beautiful music and expand your recorder horizons amidst the rocky mountains, away from hustle and bustle. Players meet new people or renew acquaintances as we play various styles of music in both small and large groups. This is a volunteer led social retreat, and not a professionally directed workshop. Players of all levels are welcome. Non-players may accompany participants depending on overall registration numbers. We keep going back to the Centre for Outdoor Education, because it has great hosts, great food, a spectacular mountain-front view and lovely hiking trails that include access to a circuit of Goldeye Lake. Accommodation is shared rooms with bunk beds. The Centre is off Highway 11, about 10 km west of Nordegg, and we help folks connect if they want to car pool. The schedule begins with the entire group in a large session and it is followed with a wine and cheese reception. Saturday and Sunday are capped off with everyone together, too. Small group sessions are planned during the day and one time slot is reserved for free time, when most people go outside to take advantage of the natural setting. After hours, harmony often fills the air as impromptu jamming sessions evolve. The basic retreat includes all events from Friday after supper, through Sunday lunch. You are welcome arrive early to rest, hike or play (bring music) until the scheduled events begin after supper on Friday. Registration generally opens in August, with a deadline close to the end of the month. Forms are posted on this website and are emailed to those on our list. Besides basic information, we ask you to mark your preferences for the small groups. Room and session assignments are posted at the Centre for Outdoor Education when you arrive. Full information is on the forms and a confirmation email provides further details. Membership may be renewed (or applied) at the same time, although membership is not a requirement to attend the retreat. The fees are detailed in the registration form. How much you pay is basically what the society pays for room and board, because all session leaders and organizers volunteer their time and talents. Note that choosing music and sharing it in a session is a simple way to stretch your own experience! Small Group sessions will be organized by playing level this year. Rather than signing up for small group sessions based on a theme or topic, the Nordegg Organizing Committee will combine players into groups based on approximate playing level. A group leader will provide music suitable for the players in the group. The registration forms will include a Recorder Skills Questionnaire . If you find you’re in a group that is either too difficult or too easy at Nordegg, you may try another group to see if it works better for you. These will be small group sessions led by advanced players with the aim of providing guidance and playing tips, and may include a combination of instruction and playing. 1. Learn to play a new recorder (please indicate which): bass, alto, tenor, soprano. 2. Playing musically: learn about music architecture and structure; shaping phrases, tone and use of vibrato, articulation for rhythmic playing – for intermediate players who play at least 3 recorders. 3. Basic Recorder Techniques: Work with an advanced player to improve your playing, including practice techniques, exercises and dexterity, hitting low and high notes, rhythm and meter, accidentals. As with previous years, there will be three large group sessions for all players occurring Friday night, Saturday night, and Sunday morning. The different orchestra sections (SATB) will be more clearly marked and will pair experienced and inexperienced players together in a balanced way. The intent is to improve the smoothness and efficiency of the playing experience, and ensure that all parts are well-covered. The Saturday night large group will again include singers and players by popular demand! To better organize this event and help with music selection, please indicate on the registration form whether you would like to sing and/or play Saturday night. Success!.....another great weekend, with perfect weather and 20 players from across Alberta -- all ready to play all sorts of music together! As usual, our hosts at the Centre for Outdoor Education kept us well fed and comfortable. A treat was that Bryan Taylor, from Gramophone (a store in Edmonton) took an array of recorders for us to try and potentially buy. 2014: How Wonderful it Was!! Where can a beginner Alto recorder player learn to play alto up in a safe, supportive environment? At Nordegg… of course. Where can a beginner Alto recorder player double with a skilled recorder player to gain practice in sight reading and rhythm? At Nordegg…of course. Where can a beginner Alto recorder player learn to appreciate the sounds of a recorder ensemble playing alongside cellos, guitars, harpsichords? At Nordegg…of course. The diversity of music, camaraderie, conversation, mountafins, fresh air, hiking and delicious meals all combine to make precious memories. In 2010 we had a large number of newcomers, including two who came all the way from Vancouver, BC. Click here to read about Mary and Karen's first-time impressions of Nordegg.